This week, Ho-Ho Heath gives his thoughts on Christmas movies that the internet says are the worst. There’s something about Christmas that brings the hate out in people. Maybe it’s the fact that radio stations started playing Christmas tunes the day after Halloween. Maybe it’s the insane traffic, or the crowds, or the shopping nightmares. For whatever reason, you’ll find people grumpier at Christmas than any other time of the year. So when I start seeing lists pop up on the internet this time of year that warn against the “worst Christmas movies of all time,” I’m not surprised. After all, most of these lists are click-bait at best, and irresponsible, uninformed journalism at worst. Each December in the past, I’ve highlighted a single movie that I think is unfairly maligned by the internet movie community. This year I’m abandoning the idea of a single movie and am taking on a whole bunch of them to see if the most popular contenders for worst Christmas movie really are as horrible as their internet reputation would have us believe. A movie that seems to be on almost all of these “worst” lists comes from 1996 and features a muscular tough guy in a tender-hearted role. Actually, there were two Christmas movies in 1996 that featured action stars in lead roles. On the successful side of things (speaking relatively), we got Arnold Schwarzenegger in Jingle all the Way. On the losing side, we got Hulk Hogan in Santa with Muscles, a flick that spent almost its entire pre-YouTube life gathering dust on VHS shelves. It makes sense that people chose to watch Arnold get a Turbo Man action figure for his kid instead of watching an amnesiac Hulk Hogan think he was Santa Claus, but this is frequently bandied about as one of the worst movies ever. I’m sorry, but that’s ridiculous. It’s not good, but even Hogan himself made far worse movies. He’s likable in the role, and the movie is aimed at kids of the 1990s who would have been familiar with Hulk Hogan and entertained by seeing him in a holiday movie. Besides, this one is worth watching just for the cast, which consists of Mila Kunis AND her future That ‘70s Show costar Don Stark, Robin Curtis (Saavik from Star Trek III and IV), SNL-alum Garrett Morris, Clint “Da Mutha Effin’ Man” Howard, and Ed Begley, Jr. I think we all know the real reason this one tanked, and it’s not because it’s awful. Just a few months before this movie was released, Hulk Hogan turned on his buddy Macho Man Randy Savage at WCW’s Bash at the Beach, becoming a bad guy for the first time in his WWF/WCW professional wrestling career. Going by the name “Hollywood Hulk Hogan,” he proclaimed himself a movie star and the future of wrestling. Audiences must have been SO UPSET by his heel turn and his over-confidence in his mainstream appeal, they boycotted this movie out of pure principle. There’s just no other explanation, right? I actually feel really bad for Hogan, because he could have been the kind of star that The Rock and John Cena are today if he’d had the same kind of promotional machine behind him that those guys did and not the tonally-schizophrenic No Holds Barred. Too bad WWE Films wasn’t making the kinds of movies in the 1980s that they would later on. We’d have gotten Hulk Hogan in a 12 Rounds sequel where he takes on the bad guys as an army of one. Santa with Muscles isn’t a classic, but it’s far from the worst Christmas movie ever made. If anything, it’s just like every other mid-‘90s action/comedy made for families. Ernest Saves Christmas is a movie I feel so strongly about that I gave it a column all to itself a few years ago. I really liked the movie as a kid, but turned my back on it when I got older. When I watched it with my own kid a few years ago, I was blown away by how earnest and sweet it was. I can understand if this isn’t someone’s cup of tea, and that’s fine. It’s goofy, clichéd, and the humor is pretty broad, missing as often as it hits. Having said that, I’m not sure how anyone could say this is one of the worst Christmas movies ever. I can think of 15 or 20 that are worse right now, and most of those hate themselves and they hate you too. Ernest Saves Christmas isn’t patronizing or cynical. If anything, it believes so strongly that each of us can make a difference by spreading the magic of Christmas that it actually challenges us to expose our own vulnerability. At the end of the day, you can’t really fault Jim Varney. When his regional comedy blossomed into national success and his most popular character, Ernest P. Worrell, achieved mainstream recognition, he could have steered into blue territory and garnered an even larger audience if he’d wanted to. Instead, he chose to focus on entertaining children and families, using his characters to hopefully inspire others to be better. Ernest Saves Christmas may not a great movie, but it has its place, and that place isn’t on the bottom of a trash pile. The internet would have you believe that Silent Night, Deadly Night 1 and 2 are widely considered to be absolutely worthless. The first movie was so loathed by parent watchdog groups when it came out in the ‘80s that it was actually considered dangerous, and became the victim of censorship and a smear campaign. Looking back on it now, Silent Night, Deadly Night almost seems tame. You can see more graphic, subversive content any given evening on television. So we’re left with the question: when you take away all the subversive, controversial elements, are the movies themselves the worst of the bunch? I don’t think so. In fact, I’d say both of these are downright entertaining when watched in the right spirit. The first film is about an axe murderer at Christmas time and the sequel only serves to up the ante in all respects. If the sequel is worthy of any real criticism outside of the premise, it would be that it’s kind of lazy and uses a too many flashbacks from the first film. Still, the worst? Puh-leeze. These are worth watching just to piss off the people who think slasher movies turn people into serial killers. With 1959’s fever-dream of a movie Santa Claus, we’re starting to get into territory where a case can actually made for true awfulness. 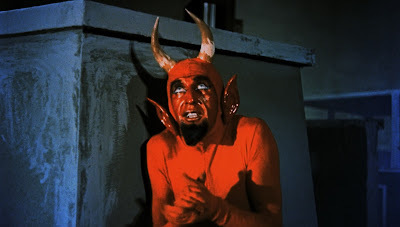 This Mexican production finds Santa Claus battling the forces of darkness as he does locks horns with a demon sent by Satan himself to ruin Christmas. Along the way, Santa must enlist the help of MERLIN, (yeah, THAT Merlin), for some magical artifacts to help him combat the supernatural obstacles that he faces so he can bring Christmas to all the children of the world. Now…listen. LISTEN. Is this a great movie? Noooooo. But did you read that description? I mean, COME ON. If this movie commits a real sin, it’s that the above story is actually kind of boring, and no movie based on that premise should ever be boring. But honestly, how can you not give it ALL OF THE STARS for trying so hard? When we have a baker’s dozen Hallmark original movies each year that are about a feisty young lady and her on-again-off-again relationship with a boyfriend who is afraid of commitment but just might be able to give her real love for the holidays when he almost loses her, THIS ends up on everyone’s “worst” list? It’ not good, but at least it’s different and unique. If the saccharine schmaltz of typical holiday fare makes you want to throw up your egg nog, this is at least something you can’t see anywhere else. It seems like all of these internet lists consistently crown one Christmas movie as the worst of all, and it’s 1964’s Santa Claus Conquers the Martians. In a shocking twist that I’m sure you NEVER saw coming, this is probably my favorite of all of the ones listed. Anyone who has actually watched this movie and still says that it’s the worst Christmas movie has only seen seven movies in their entire life. How can you not love it based on the title alone? Yes, it’s low-budget. Yes, it’s a little slow. But you know what? It has people in polar bear suits, ancient beings with mystical powers, people in green face paint and tights, and a ROBOT. People who don’t like Santa Claus Conquers the Martians probably don’t like Japanese monster movies or Kung Fu flicks either. Bruce Lee? HACK. Sonny Chiba? LOSER. I mean, seriously, what’s not to love? Bright, mid-sixties colors? Check. Catchy, swinging musical intro? Check. Thinly-veiled message about the dangers of too much television? Check. Look, I know this is one of those movies that Mystery Science Theater 3000 made infamous. I also get that MST3K is beloved for taking big Cleveland steamers on top of the movies that they feature. Question: since when did MST3K become the arbiter of what is good and what is not? I loved those guys as much as anyone during the ‘90s, but have you ever watched any of those movies without their commentary? The movies are pretty entertaining all by themselves. MST3K has a place, but they aren’t the last word in what is good and what isn’t. This movie is exactly what it wants to be. 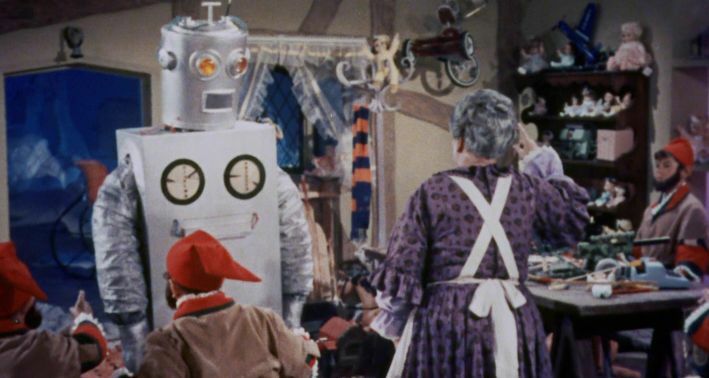 There is no colossal irony where the filmmakers of Santa Claus Conquers the Martians thought they were making a Bergman film and accidentally made a camp classic. No, they MEANT to make a camp classic. Racial violence was on the front page of the news every day. America was slipping deeper and deeper into the conflict in Vietnam and U.S. troops were getting killed for reasons no one could explain. This movie is a deliberate reaction against the horrible direction in which the sixties were quickly heading. Give the kids something to take their minds off of the horrors of reality. Give them Santa Claus, but for the atomic age! 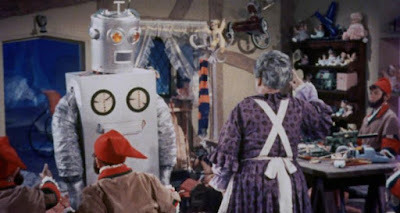 Is Santa Claus Conquers the Martians a good movie? Well…no. But I’ll take its mid-century kitsch and deliberate optimism over another big-budget holiday movie full of commercial sentimentality that’s designed to cut straight to our emotional heartstrings. The fact is that we live in a time where everything is exactly the same. Most of our movies look the same. Every movie trailer sounds exactly the same. The mall in your city looks exactly like every other mall in the nation, and probably has all the same stores, too. If you want to eat out at a restaurant, you can dine at the same 25 restaurants no matter where you are. We should champion individuality and movies like these for being so weird and crazy, and for not being afraid to disrupt the status quo. So what if they aren’t all fantastic? I could probably count all the truly fantastic Christmas movies on two hands. That doesn’t make everything else “the worst.” So here you go, Internet Echo Chamber (not you guys reading this; you’re the best). Here’s an opinion from someone who actually watched the movies you said were the worst of the worst, and an explanation for why they aren’t. Now as for the actual worst Christmas movie of all time…I think Adam Riske discovered it last year. 2014’s Saving Christmas, starring Kirk Cameron is the most insipid, uninspired “movie” I’ve ever seen in my entire life. My opinion of it doesn’t even have anything to do with its heavy-handed message, but rather the complete lack of tact, skill, and value that it offers to justify its own existence. All the other movies I wrote about in this installment have an honesty and earnestness behind them in that they want to tell a fun story. Saving Christmas is less concerned with those things and more interested in a false premise that I don’t think exists anyway. I suspect the entire project was made for free. It appears to have been shot on a cheap, HD digital camera, and I wouldn’t be surprised if everyone in it worked with no pay, including the editor and the “special effects” guy. Kirk Cameron knows better. He’s been an actor for decades, and he knows how to give a performance and how movies SHOULD be made. Even more offensive is that the director and co-star is Darren Doane, who used to direct punk music videos for the likes of Blink-182 and Pennywise. It breaks my heart that he’s traded in his rebellious spirit for pseudo-spiritual pap like this. The Christian movie market needs free-thinkers and a few punks to shake things up. Perhaps even more sad, I suspect that Doane thinks that he DID make a punk rock rebellious movie. He didn’t. Saving Christmas is less a movie and more an extended video sermon designed to be shown at churches during the holiday season in place of Sunday evening services. At no point does it feel like anyone gives a crap about making art or telling a story. Even the poster and cover art is entirely misleading. Shame on you, Saving Christmas. You make the 1959 Mexican Santa Claus look like Citizen Kane. I’ve never seen a lazier, joyless movie. Ever. Riske nailed it. So it looks like we found a really awful Christmas movie after all, and the internet was right about this one. Steering clear of the last one, though, I think you’re fine to ignore those insufferable “worst” lists and give any of the other movies a shot, especially late at night when you’ve got a nog hangover and just need something goofy to watch while you chill out. They seem to play best when you’re in the place between sleep and awake. You know, the place that Santa Claus lives, with the Martians, the robots, and Merlin. I hope you stuck with me through all that, but if you didn’t and decided it was TL; DR, let me wish you happy holidays and a tacky Christmas. A little surprised that Santa Claus: The Movie didn't get a mention, even though I think it does rise a bit above Saving Christmas's exceedingly low bar. Patrick has a great review of Santa Claus: The Movie elsewhere on the site. I haven't seen it in a while and can't vouch for it. I remember liking it, but I don't trust my memory at this point. 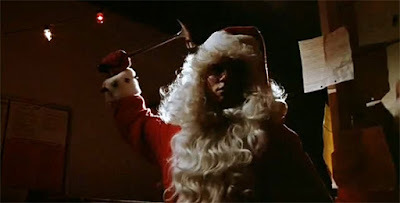 I heard on the Now Playing podcast that it was specifically Catholic groups which tried to organise a boycott of Silent Night, Deadly Night; not because it presented a murderous version of Santa that would tarnish this beloved character in the minds of kiddywinks as they claimed, but because it was the child's abuse at the hands of vicious nuns in the orphanage at the start of the movie which led to his eventually becoming a killer. Their objections amounted to Helen Lovejoy's "Won't somebody please think of the children!" refrain but were all to do with projecting the Church. Siskel and Ebert condemned the film too, with Siskel going so far as to read out the names of the production crew on air and saying they should be ashamed. Some strange bedfellows there. The most egregious example of a studio Christmas movie in my opinion is 1998''s Scrooged. For most of its run time it's not terrible, but it completely soils the bed in the final scene where Bill Murray breaks the fourth wall and encourages the theatre audience (the actual theatre audience in buildings up and down the land) to get up from their seats and start celebrating and embracing fellow audience members. It might be the most cringe-inducing moment in cinema history for me. Did the film think theatre patrons would be streaming into the streets afterwards with a 'Merry Christmas' on their lips and a song in their hearts? Bad movie. Get in your basket and think about what you've done. One of Leonard Maltin's books suggests that the filmmakers might not have been sincere in their intentions, though, so maybe the joke is on me. The Alastair Sim adaptation (avoid the colourised print at all costs) of Dickens' classic is my favourite, although the Muppet version (Michael Caine plays Scrooge straight and leaves the laughs to the Muppets, which is a clever approach) and Patrick Stewart's faithful TV movie are a close second and third. Jim Carrey can keep his awful-looking cartoon. If Kirk Cameron had only battled Satan alongside Santa and Merlin and maybe Alan Thicker he could have avoided this ignominious fate.